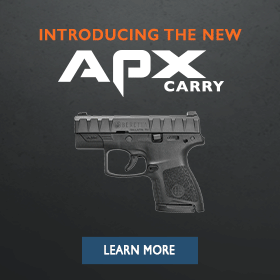 April 15, 2019 Beretta is excited to announce the launch of our brand-new pistol, the Beretta APX Carry. Specifically designed for concealed carry, the APX Carry pistol extends the proven Beretta APX series to now include a single stack, sub-compact profile offering. Beretta Defense Technologies (BDT) is pleased to announce its Platinum Level Sponsorship of the USASOC 10th Annual International Sniper Competition scheduled for this week at Fort Bragg, NC. BDT will be exhibiting at the vendor display on March 21-22, located on Range 37, where the competition will be held. Beretta, Steiner, Sako, and Benelli products will be on display. Team Beretta shooters recently achieved 10 podium honors in 5 different events at last week’s 2019 Seminole Cup in Woodbine, GA. Team Beretta shooters recently achieved 13 podium finishes in 7 different events at last week’s 2019 Gator Cup in Okeechobee, FL. Now through February 18, 2019, Beretta will be running a President’s Day promotion in which you will be eligible to receive 20% off your entire purchase if you spend $150 or more on BerettaUSA.com. Beretta is pleased to announce that we have partnered with Zamberlan to bring our customers a brand-new line of hiking and high-performance boots designed to work in any environment. Team Beretta shooter, Joseph Fanizzi, recently achieved podium honors in 6 different events at two regional competitions. Beretta anticipates thousands of visitors next week at its redesigned SHOT Show booth. The booth has an open floor plan with new visuals and several redesigned designated product areas.